Tying 24's, not recommend after a couple of cold ones. Since it's winter, and there isn't a lot of angling going on, and there is a lot more tying taking place, we figured it would be fun to share some of what we've been working on. I actually enjoy winter, because it's a bit of break from fishing and a chance to focus on tying. To me personally, tying is the other part of being a fly angler. An important part. Do I tie all of my own flies? No- I'm not that fast. There are certain patterns that I purchase by the dozen. Then there are times when tying feels like a chore- like in July, at 9:30 at night, when I need to slam out half a dozen Slumpbusters and get lunch together for a trip the next day. But winter is a chance to sit back, and enjoy the process. Brew some good coffee for an early morning session, maybe get together with some friends in the evening and crack some cold ones and fill the empty spots in the boxes, whip up some hot new pattern, and maybe even dream up the next fishy concoction that just might be THE ONE. With the streamer boxes full, lately I've been cranking out some bugs on the vise. Spinners. Don't underestimate them. I like to carry them in a range of sizes. Rusty colored ones cover a pretty wide range of bugs. 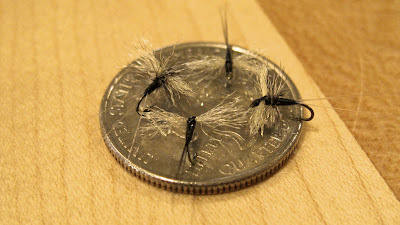 Make sure to carry some small ones like those above to cover trico and BWO's. I tie them in a bunch of sizes, colors and styles. Dubbed bodies, quill bodies, thread bodies, micro-fibbett tails, hackle tails, yarn wings, poly wings, hackle wings. They all work. Spinner wings are generally clear, and the spent egg layers usually lie flat on the water, wings extended out to the sides and flush on the water, as opposed to upright like a recently hatched dun. The easiest to tie might be the Compara-Spinner as described in Caucci and Nastasi's classic Hatches. Real simple, tie in tail fibers, dub a tapered body with some super fine, tie in a dry fly hackle in a light dun or cream color (spinner wings are clear), dub to the eye, wrap the hackle over the thorax dry fly style, tie off the head, then clip the hackle flat on the top and bottom so the fly rides low on the water (hackles only extending off the sides of the fly). Fish them on top or just below the film. Can't see them? Add a small dab of strike putty two feet up the leader, or fish them as a dropper off a visible dry fly that acts like an indicator. Think spinners aren't important? 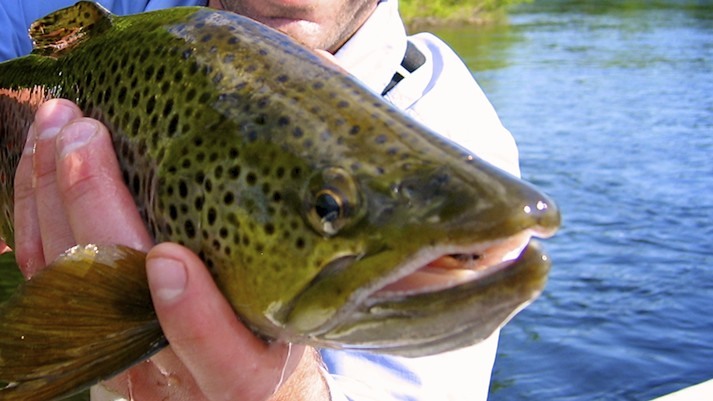 One of the better browns that I've seen come out of the Kennebec in the last couple of years (a solid 20" fish) sipped a size 12 Compara-style March Brown spinner on a bright sunny afternoon in May. The next time you run into rising fish eating something "invisible" on top or in the film, pay close attention. Are there mayflies hovering en masse above? Look in the scum lines where the garbage collects. Look closely at the water. Usually a spent mayfly is flush in the film or subsurface and very hard to see on a casual glance. And finally, break out a seine. A small piece of screen works fine and can save you some fly changes as you start dialing in the code.